Stork Craft is a prominent name in the world of furniture manufacturing, especially, building high quality cribs. The 4-in-1 Fixed Side convertible crib comes with all the great functionalities that you ever wanted for you newborn’s baby crib. Having extra storage space is always a plus point for any bed. With this unit, you will get 3 huge size drawers, 3 shelves and adjustable mattress. Not all the cribs come with all these extra storage features. Keep on reading further to know more about the specifications, pros and cons about this flagship product from Stork Craft. Multi-functional: There are lots of benefits of buying Stork Craft product, especially, 4-in-1 convertible. The versatility of this unit allows you to do many things with the crib. It includes: waterproof changing pad, large storage space. The drawers can easily be attached to the crib whenever is required. 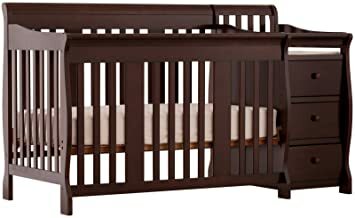 Safety: Never buy used or non-certified cribs. They are not safe at all and can’t provide the protection to your little one. Instead, you should always look for a crib that is certified from the government. Stork Craft has been making baby furniture for over 70 years and their products are top notch in terms of quality, innovation and most importantly safety standard and this is the best safest baby cribs for your toddlers. Size & Height: As I said before, the product comes with 3 drawers and 3 shelves which is huge amount of storage space. You can keep lots of baby stuff, soft-toys in the storage. It has a dimension of: 71 x 32.5 x 43 inches. Long Lasting: Stork Craft 4-in-1 crib can be converted to toddler bed, full size bed, and day bed. That’s why it can be used for a long period of time. As soon as the little one grows you can easily convert the crib to a day bed. The soft and relaxed mattress allows the kid to have a good sleep. Storage: This product doesn’t lack the storage space. As I said before, there are two furniture storages comes with this unit: 3 drawers set and 3 shelves. And they can be easily attached to the crib. This is a best infant baby crib that comes with drawers and other storage space. You also get a waterproof change pad so you don’t have to pay anything extra for that. It is a certified product from CPSC and JPMA. That’s why you can assure the safety and protection of the newborn. Stork Craft 4-in-1 might be an expensive product for most of the people. But with all the great features and advantages you get with this unit, are not possible with any other cribs. Convertible crib needs more space to fit properly within the room. So you will need to make sure that there is a plenty of space in a room where you will keep the crib. Stork Craft is a recognized brand that makes world’s best baby furniture. They use high quality material, wood to manufacture their products. In case you are looking for premium quality baby furniture then this is the right company for you.